The basic treatment for grief is discussed in Section 6. Often, however, a grieving patient will benefit from additional contacts, activities, associations, and so on, as discussed in Section 7. A normal grief process is sufficient in itself, and the patient may improve [there is no Section 50 yet] and terminate [Section 46]. If a patient doesn’t improve in a reasonable period of time, you may need to modify your current approach [Section 6], or look for more helpful adjunctive care. It is also possible that a patient fails to recover from normal grief because something else is going on, most likely depression. 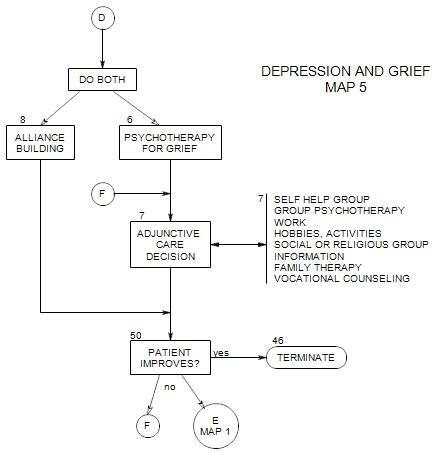 In this case, you might need to return to Map 1B and treat him/her as a depressed person. Throughout treatment, you continue to work on your relationship with the patient, as shown in Section 8.